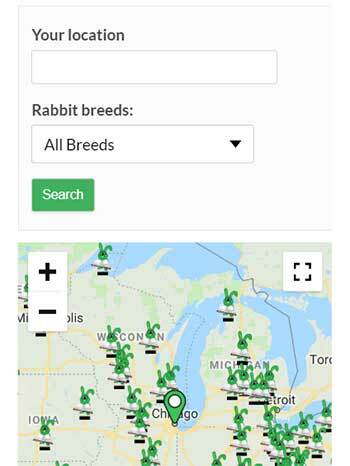 Learn more about Lionhead Rabbits! The origination of the Lionhead rabbit is not really known, although they are believed to be a cross from Angora or Belgian Dwarf to Swiss Fox. They began showing up, in what many refer to as being a genetic mutation, in France and Belgium in the 1960’s. Due to the distinguishably desirable mane of fur surrounding their heads, breeders began working with these “mutations” to lock in those genes, so they would securely be passed from one generation to the next, resulting in the breed that has become known today as the increasingly popular Lionhead. Additionally, they were recognized by the BRC in 2002, then further developed and recognized by the ARBA in 2014. Lionheads are a small, compact rabbit that is instantly recognizable by the longer mane of fur around its head, giving it the resembling appearance of a Lion’s mane. They are available in a wide variety of colors, and with a single or double mane. 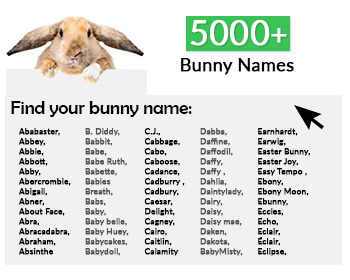 It is commonly said that they are one of the cutest rabbit breeds in existence, making them increasingly popular as both show animals and pets. Typically, they are lively, sociable, friendly, and good-natured. However, they are quite timid, and as such they scare easily, which can cause them be show signs of aggression. For this reason, they are not suggested as the ideal breed of a rabbit to have as a pet for a small child. 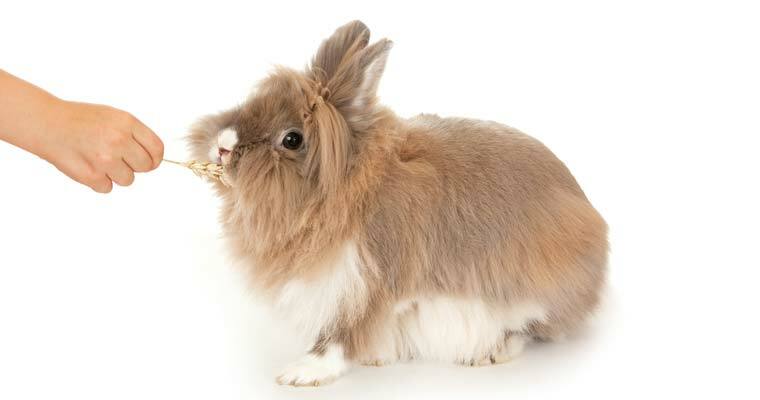 How do I care for my Lionhead Rabbit? Lionheads require a bit more attention in the grooming department than what the short-furred breeds require, as their wooly main –be it single or double- needs to be brushed out at least once a week. Additionally, when they are molting, they will need brushed more frequently – on the average of at least 3 times per week, to help prevent them from getting Fur-Block, which can be fatal. Their nails should be clipped approximately once a month, as well as being thoroughly checked for any other physical abnormalities, such as abscesses or malocclusion – which is a hereditary dental problem. Otherwise, they require high quality pellets, on the average of 1 cup per daily feeding, as well as fresh timothy hay, and clean water, plus due to the additional fur carried with this breed, it will be very beneficial to provide them with a small piece of fresh pineapple or papaya every few days. If buying fresh is not an option, you can use canned – but make sure it is UN-sweetened, in 100% natural juice, or chewable supplements can also be used, broken or crushed up, and added to their pellets. They do well in a 24 x 24 cage, however, because of their level of activity, a larger cage would be better, or the allowance of having a larger area available on a regular basis to provide ample space for exercise. 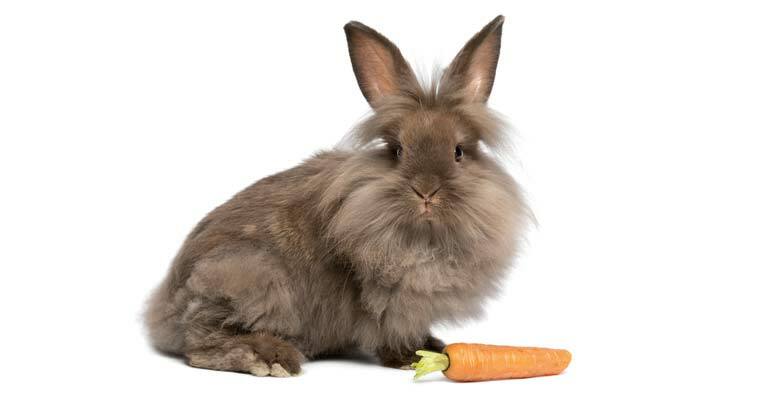 Furthermore, Lionheads – as it is with all rabbits – should never be bathed. Is my Lionhead Rabbit show quality? To properly evaluate a Lionhead, as it is with all breed-evaluations, he/she should first be properly posed. Lionheads should be posed as sitting in an upright position, with front legs straight and feet resting flat on the table. The chest and mane should be fully exposed, and the body should be sat, resting on the rear end, with hind feet tucked squarely under the body. The head should not be pushed or forced down, and ears are to be short and stand erect. The body should be short, compact, and the chest should be broad, and well-filled, as is the same case with the lower hips. Lack of, or poor quality manes are basis for disqualification, although softer wool is permissible in juniors, the seniors’ wool must be strong, full of life, and have a medium-soft texture and have an evident crimp in the fur. Additionally, guard hairs may be present but should not create a coarse texture to the wool. When showing Lionheads, each variety (color) is exhibited individually. 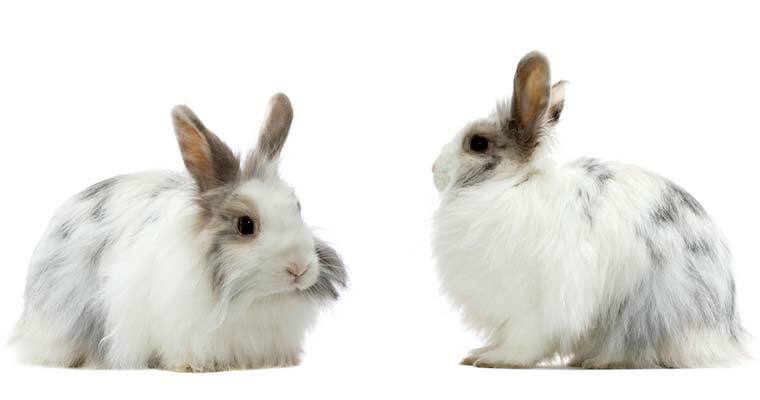 Two Lionhead Rabbits, aren’t they lovely? Furthermore, you will need to know and understand the difference between a double, single, or no mane in order to more correctly evaluate this breed. A double-mane is one that has wool all the way around the head, and some have transitional wool around the skirt, which is the hindquarters, hips, and tail. A single-mane is one that is around its head, ears, chin and sometimes chest. The biggest problem with the single-mane wool is that it gets thinner as the rabbit ages. Then last but not least, a Lionhead with no mane at all will look a lot like a large-size Netherland Dwarf. Also, notably, one of the most difficult tasks with breeding these adorable little bunnies is in the ability to be able to produce consistently correct manes. You might also like: 5 reasons why you should have a Flemish Giant! TYPE: compact, short, and well-rounded, having deep shoulders, with hindquarters of slightly less depth. Legs are to be medium length & bone, & well-balanced to body. WEIGHT: Seniors (6+ months of age) at 3 ¾ pounds (1.587kg); juniors (under 6 months) are not to weigh over 3 ½ pounds (1.587kg). Minimum weight is 1 pound 10 ounces. HEAD: bold, wide, and slight roundness between the eyes, but not round from all directions. The muzzle is to be well-filled. The head is to carry a high with no visibility of neck. Eyes should be bright and bold, and match described color per that variety. EARS: erect and well set, but not necessarily touching; when relaxed ears will be carried in a slight “V” shape. They should be well-furred, balanced, and rounded at tips, with heavy wool more than halfway up the ear length. FUR & WOOL: (*transition: significantly shorter wool on hip or face) … The mane wool is to be strong, medium density of soft, textured, and have crimping. Softer wool on Jr’s is allowed. Guard hairs may be present. The wool length must be at least 2 inches (5.08cm) and form a full circle around the head, which may extend into a “V” at the back of the neck. The density should heavy, with fur that is full and thick enough to make the mane stand out, full and prominent. The mane may form a wood cap across the brow. Below the cap may have transition wool up to 1 inch (2.54cm). The cheeks extending into the whisker area may be heavily trimmed; the side trimmings and chest wool may be longer. COAT: roll-back, yet is soft, dense, medium length, and shiny. The saddle must be clean of wool. Transition wool is allowed on the flanks. TORT – (black, blue, chocolate, or lilac) Black and Chocolates are to have brown eyes. Blue and Lilacs are to have blue-grey eyes. The Chocolates with a ruby cast to their eyes is permissible. TYPE: short, cobby, firm, well-rounded body, shoulders and chest broad and well-filled, with deep shoulders balanced to hindquarters which are also deep and broad. HEAD: broad with good width between eyes and well developed muzzle; head should be attached to body with no neck visibility. EARS: not to exceed 3.5in (8.89cm) long & balanced to body size, erect, and not necessarily touching, thick and well-furred, & slightly round tips. When relaxed, ears should carry a slight “V” shape. MANE / BIB: The mane will form a complete circle of fur that is longer, between 5 – 7cm (2-3inches) in length & medium soft; guard hairs may be visible but not create coarse, forming a “V” at the back of the neck, blending into a fringe around the head. Fur on chest is to form a ‘bib’ and very dense. The mane may form a cap across the brow to increase prominence of the mane. The longer fur on the cheeks should mix into the whisker area, but not the middle of the foreface; below the eye line should not have long fur. 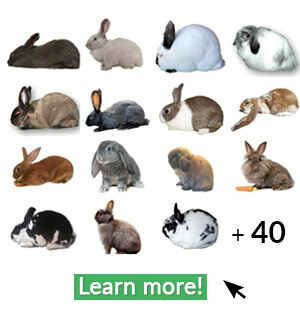 COAT: dense, roll-back, medium length, and saddle should be free of longer fur; extended fur at the flank line (aka “skirt”), going down the length of the rabbit’s body that starts at shoulder and goes down to tail, extending into the groin. When skirt is lifted, a normal short coat should be seen. The skirt should not cover the entire sides, and should not touch the saddle on Jr’s; it may be thicker on adults, but is to have signs of this clearing on the saddle, showing a clear distinction between the back top and skirt development. CONDITION: very healthy, vigorous, and clean, particularly on feet, ears, and groin areas. There is to be no knots or matting around the mane, bib, and skirt.